What an eventful, ridiculous and absolute insane game it was. And that was just for Game Five of the ALDS. The Toronto Blue Jays overcame a 2-0 deficit in the series to come back and defeat the Texas Rangers in a Game Five contest that had it all…suspense, excitement and a few benches-clearing moments. It all resulted in a 6-3 win on a Jose Bautista 3-run home run (with a crazy bat flip) but that is not the reason why this game will be remembered for me. Sure, the home run was epic. The Rangers scoring the go-ahead run on a Russell Martin throw into a bat. The three Elvis Andrus errors in the 7th that led to the Blue Jays’ comeback. But the thing that stuck with me the most was the display from the Toronto Blue Jays fans. The fans have always been crazy; they certainly have an affection for their team, especially since late June. However, today’s actions crossed the line. While being engaged throughout the game, the 7th inning rolled around and as Odor was awarded home plate on a confusing, yet correct, play call. 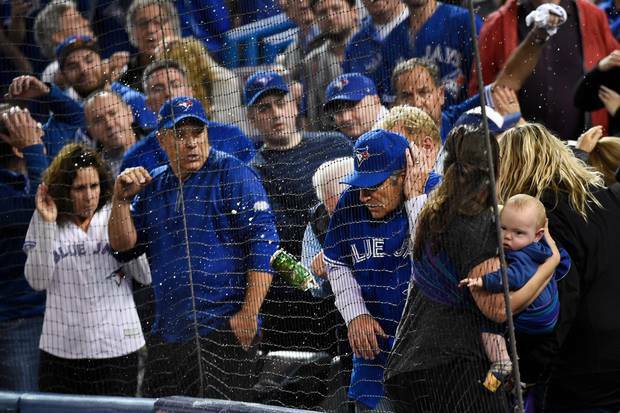 So the most common thing would be to boo and yell…however, the Blue Jays fans did that and even more…like throwing items on the field. Beer cans. Anything they could get their hands on. And they roared on and on as the umpires met to review the ridiculous play. After much deliberation amongst umpires, the fans continued their aggression on the field. At that point, even the Toronto players were yelling at the fans to stop throwing things. They were holding up the game. When the players are telling you that you are wrong, you are wrong. This continued even after, when Bautista hit his game-winning home run, when Edwin Encarnacion came up to bat and had to tell them to calm down and stop. This was just a disgusting display of emotion that makes me embarrassed. Yes, baseball is an emotional sport at times, but I have never witnessed something like that. This was a game of firsts, for sure. What grabbed me most was seeing the families in the crowd, covering their child’s head because they could have gotten struck by the beer cans over-emotional and rude fans. No parents should have to protect their children from raining beer cans when all they were all here for the same reason: to watch their team win. Seeing the mothers crying and the mess on the field, it became clear that not only were these actions did not just show fans’ distaste for the game; it showed their disrespect for it as well. Blatant disrespect for the rules of the stadium as well as blatant disrespect for the game of baseball and the teams playing it. The game lasted 3 hours and 37 minutes but could have been shorter…due to the fact that they had to delay the game numerous times to clean up the mess left behind. Yes, a victory in a decisive playoff game is something to be excited about. Playoff baseball is known for being emotional, but the fans have taken it too far. It is disrespecting the game itself and the people that play it. Football fans are known to be a little crazy. Baseball fans are known to be passionate. Throwing beer cans and trash to express disagreement at a call? Not passionate. That is just classless. I’m glad Blue Jays’ fans are following their team so closely, but I hope that this is not a sign of things to come. If disrespect of the game and the umpires is something that is going to become popular, then count me out. This is not what baseball is about. This is not what baseball needs. And this is not the baseball I know and love. Blue Jays fans duck in fear of being hit by beer and trash during the 7th inning of Game 5 of the Texas Rangers-Toronto Blue Jays game.